My creative efforts have been shifted this week. I've had to put my crafty creations on hold and focus on creatively planning a youth event that is coming up. Event planning is fun but there really is a stress relief in playing with paper, ribbons, and paint and I'm in need of a crafty fix. 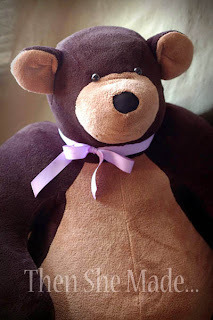 The first one I ever made was for my oldest daughter when she was just 18 months. The bear was SOOO huge compared to her little toddler body. I loved watching her try to carry it around. She loved that bear! It was our reading bear. She and I would sit between the bears legs, lean up against it's body, and read books. Such a great memory. Years later, her twin sisters saw pictures of her bear and wanted one too. This is the cool part ... while I was Walmart one day, I noticed they were clearing out a bunch of winter blankets for $3. 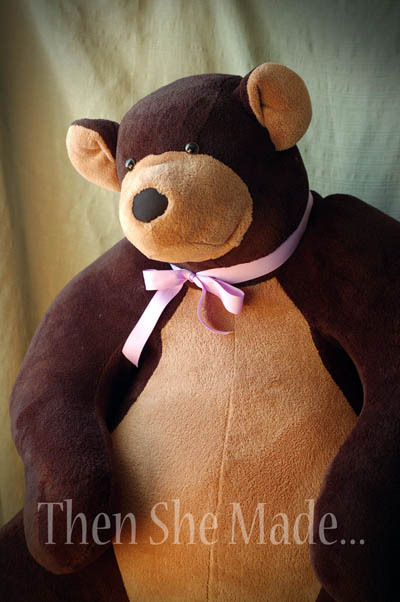 They were brown and super soft and PERFECT for bears. So, I dug out my pattern, set to work and made them each their own bear. 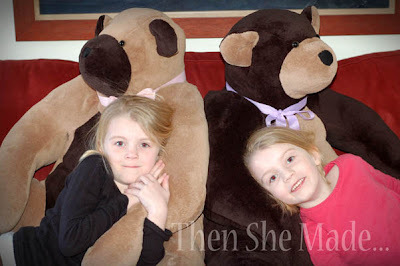 They love their bears and still have theirs. They sleep with them. Use them for floor pillows. For fort walls and to watch tv in. And, truth be told, I've used them a few times too. There is something so comforting snuggling up in a stuff animal of that size... even when you are 37. Seriously, they make Sunday naps on the living room floor so much more enjoyable. So, here's the deal. Lots and lots of stores are clearing out their winter items right now. If you see blankets for the cheap - BUY THEM. Then make your kiddos a bear. They will think you are the best mom ever! Are you familiar with this site? It might have some good ideas to bouce off of for your project.